Before I start, a disclaimer: All of this is, of course, highly subjective. I read nonfiction for enjoyment, and I enjoy nonfiction most when I am learning interesting things, or am guided to think in new ways. Preferably, claims should be backed by peer-reviewed studies, or presented as speculation otherwise. Either way, the author should be clear about this, and unbiased enough to present different sides of the issue. With that out of the way, let’s look at the rules. The best nonfiction books I have read have invariably been by folks who spent their lives researching that particular issue. A couple of books in this category immediately come to mind: Why We Sleep, The Language Instinct, Gödel Escher Bach. Positive indicators of this in a blurb may include “Professor in [field directly related to the book’s topic]”, “Long-time researcher in [field directly related to the book’s topic]”. Similarly, be wary of terms like “expert”, “thought leader” and “journalist”. Yes, no books by journalists, unless it’s about journalism. If the author is not an expert in the field, they should at least be a long-time practitioner. Malcolm Gladwell’s books are enjoyable—there is no denying he tells compelling stories—but ultimately they rely heavily on anecdotal evidence. In general, I find that books by journalists cherry-pick examples to fit the argument, and gloss over (or completely ignore) evidence to the contrary. Rule #1 does not apply to Biographies. Biographies are different. You do not need to be a professor of history to write a compelling and informative biography on John D. Rockefeller, nor do you need to have known him personally. I have read many excellent biographies written by journalists. Journalists are experts in the skill of using many disparate sources and weaving it into a compelling narrative. Certainly, this often results in opinionated character depictions, but I believe these are subjective by nature. Unfortunately, Goodreads ratings are often not unbiased, and many of the reviews are from readers who received free copies in exchange for their reviews. That’s why this is only Rule #2. It’s also a good idea to read some of the lowest-rated reviews first, to see what the main complaints about the book are, and whether they would put you off reading it. This is targeted at books that market themselves as “the surprising truth” or “the surprising science” behind such and such. Often these books are already discarded by Rule #1 and #2. But for when they are not, Rule #3 exists to protect against over-simplification and one-sided arguments. I have not read all books with “surprising” on the cover, but the ones I have, I have found to be lacking. Why We Sleep: The New Science of Sleep and Dreams by Matthew Walker is hands down the best nonfiction book I have read this year. It is also the most terrifying. An experienced sleep scientist explains the ins and outs of sleep and the effects of sleep deprivation on human health. I tell just about everyone I meet about how fantastic this book is. And luckily, it also meets all the criteria for a good nonfiction book. Phew! Gödel, Escher, Bach: An Eternal Golden Braid ranks among my favorite books of all time. It takes dedication to read it, but the insight (and humor!) in this tome is priceless. Written by a professor of cognitive science and comparative literature at Indiana University, Gödel, Escher, Bach explores common themes in the lives and works of logician Kurt Gödel, artist M. C. Escher, and composer Johann Sebastian Bach, and expounds concepts fundamental to mathematics, symmetry, and intelligence. The Lean Startup: How Constant Innovation Creates Radically Successful Businesses, by Eric Ries. As a startup founder, Eric Ries was arguably not an expert in startups when he wrote this book, but he was a long-time practitioner. This book gives excellent advice, and has been a manual used by many successful businesses across the world. Endless Forms Most Beautiful is by an expert in evolutionary development, and both its subject and its prose are, indeed, most beautiful. In The Gene: An Intimate History, Siddhartha Mukherjee relates stories from his childhood and family to bring the realities of the diseases he spent his life studying into focus. It’s rare that a book is both as moving and enlightening as this. Inferior: The true power of women and the science that shows it, by Angela Saini. This one, being written by a journalist, breaks rule #1. Although it was a compelling read, and I learned some interesting things, the argument was one-sided and ignored a lot of evidence against it. 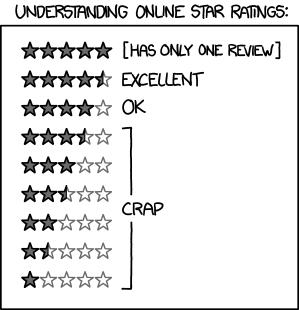 See this review for a thorough explanation. Alibaba: The House That Jack Ma Built, by Duncan Clark. An enjoyable read, but not very memorable, nor does it provide much insight into Alibaba itself. Outliers: The Story of Success by Malcolm Gladwell was an entertaining read, there is no denying that. But like other Malcolm Gladwell books, it cherry-picks examples and tries to draw grand conclusions from them. We are left with interesting ideas, but only anecdotal evidence to judge them by. How the Mind Works, by Steven Pinker, covers a topic that I am endlessly fascinated by. It is also written by the author of one of my favorite books, The Language Instinct, so I really expected to enjoy this. However, I found it rather dry. You can read my full review on Goodreads, but I gave it 2 stars at the time. And with a Goodreads rating of 3.97, it only meets 2 of the 3 criteria for choosing good nonfiction books. Money: Know More, Make More, Give More, by Rob Moore. I don’t even want to talk about how bad this book is. But the fact that it broke two rules is a good indication that the rules are on solid ground. I found The One Thing: The Surprisingly Simple Truth Behind Extraordinary Results by Gary Keller to be very repetitive, and every example was explained as the person focusing on “one thing”, when instead they were clearly focusing on multiple things. Also notice the use of the phrase “surprisingly simple” in the title! In fairness, Goodreads users don’t agree with my opinion: the give it an average rating of 4.16. That’s fine, and also why I don’t rely solely on Goodreads ratings. I’d encourage you to read at least a bit of the book, and see whether or not you agree. For this small sample of books, the three rules perform remarkably well. I’ll admit, I am surprised! On average, I rated books that meet all three criteria 4.6 stars, two out of three criteria 2.75 stars, and one out of three 1 star. Of course, my ratings are completely subjective, but I did give these ratings long before coming up with the rules, and they seem to be a very good guide. Do you use a different set of rules? Or do you have a system that covers fiction books as well? I would love to hear about it.